When I first experienced my "rude awakening" (or shall I say 'crude awakening') regarding the reality and existential truth of my career path, it was a really a turning point for my ownself. Being a chemical engineering student who deal with big multinational corporation when it comes to viewing my own career prospect, it should be a boon rather than a bane. I guess that is the foremost raison d'être of me in choosing UTP as my tertiary educational institution. Being the best student for my own school the prospect is huge. Alas, I chose to stay in UTP despite having chances to study abroad as my plan was to make networking among UTP students so that perhaps I could excel in PETRONAS during my working days in the near future. Everything was great untill I found out the truth of the industry and its relation to geopolitical conflict throughout the world especially in the South. From that point onwards, I started to enmesh myself into politics, sociology and economy subjects, of course by my own reading, thus revealing more atrocities that are hidden behind the promising career ahead in oil and gas industry. Not just that, guidance from renowned NGOs such as Friends of the Earth Malaysia and Citizen International had given me great impact upon my activism ideology. From that point onwards, I never turn back unto my distant past like normal youth in university. No more video games, no more guitars, back to basic: knowledge. One of the special places that made me feel "fired up" upon this activism activity is Niger Delta in Nigeria. I always view the pictures of its natives which live in dire state under the barbaric neo-colonialism of Shell (better known by activist as S-HELL) and of course with the support by Nigerian unscrupolous military regime. A real day light robbery by the great capitalist machine called Shell. 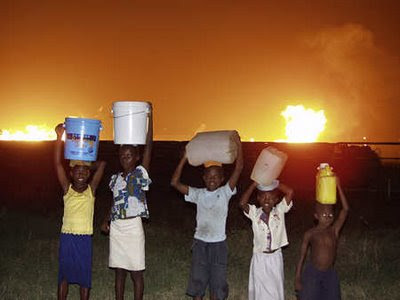 The future, even the present is bleak for these kids in Niger Delta. As time passes by, I rarely check upon its situation anymore as I got stuck into philosophy, theology and metaphysics for the past 2 years. Yesterday as I watching the tube, I noticed a profound news regarding Shell and the fiasco at Niger Delta. Then came this man into the news: Ken Saro-Wiwa. I never heard of him before. Maybe due to lack of reading about him. Alas, that did not stop me from giving an uppermost attention unto the news regarding him. The big news that shocked me yesterday was about the legal settlement on Niger Delta human rights cases. After legal battles lasting nearly fourteen years, oil giant Royal Dutch Shell has been forced to pay a $15.5 million out-of-court settlement. This success story would not happen if man like Ken Saro-Wiwa did not put his life on balance in defending the rights of the oppressed in Niger Delta. Blatant corruption, unhindered environmental degradation as well oppressive human rights violation which being commited by Shell through hiring thugs and police forces had made Ken Saro-Wiwa decided to stand up against these attrocities. For that also, he ended up on gallows in 1995. Yet his spirit in defending the rights of the oppressed is still lingering among Niger Delta inhabitants as well through out the world among other activists. When I googled up his name in the net, I could see numerous sites, articles that being written up to preserve his legacy so that people will never forget his selfless-contributions in championing the oppressed as well reclaiming justice for them. The news was a great and momentous moment for all environmental and anti-capitalist activists through out the world. Even though the court settlement can't bring Ken Saro-Wiwa back but his legacy will lives on and constantly reminding us about the truth of this hideous capitalistic system that only knows how to churn our planet's depleted resources in the name of idiosyncratic growth. If confirms my vow 3 years ago that I would not want to work with any oil companies except PETRONAS as other big oil companies have shed people's blood and undermining the environment for mere profit making in oil and gas industry. I would not want to work with any companies that violate human rights across the globe. May Ken Saro-Wiwa's legacy lives on for future generation and hopefully may intelligent engineering students are not dumb enough to fall into this worldly trap of making money out of people's livelihood. 1. Will Shell pay-out Niger Delta? tapi lapangan oil & gas inilah yang paling diburu oleh kebanyakan mahasiswa khususnya dari lapangan kejuruteraan. Huhu. Betul Exxon lagi syaitan. Orang kata diorang ni "The Man in Black with Red Tie". Only business. No CSR. Betul pun. Kawan2 dari Sudah dah cite.